Deb Diesen is the queen of the plot twist! In her Picture Day Perfection, we’re riding along with our sullen protagonist on his way to the photographer’s stool, even feeling a little bit sorry for the messy mix-ups this kid is enduring, to discover that he had it all planned out – perfectly! That little twit. He had me right where he wanted me the whole time. Not only did Deb craft a clever tale, Dan Santat’s illustrations kept me smiling with each page turn. Y’all, this book is straight up funny! If you’ve got a kooky kid in your life, this one’s for them. Get it. They’ll love it. And, if you’re hoping to lead said kooky kid into a deeper study of foundational skills in literature, download the guide. Strike while enthusiasm is hot, right? Along with series of pre and post reading discussion questions, the guide presents writing and illustrating prompts, a study of adjectives (which Deb highlights masterfully in the text), a calendar/sequential numeric activity, and a super fun construction paper photography craft that I just have to tell you about. I have a passion for making quirky, inexpensive kiddie crafts. Give me some tape, construction paper, and a sunny afternoon and watch me go! 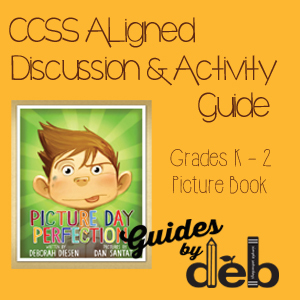 And, that’s just what I did with an activity for this Picture Day Perfection guide. The catch is, though, I don’t live in Texas anymore, where the sun shines brightly almost every day of the year. No. I live in Michigan now, where gun-metal grey skies dominate the calendar. This change in locale made the processing portion of this project a little bit more challenging. When you download the guide, you’ll see that sunshine is a key procedure element and, when I was making a sample for the guide, I couldn’t find any! I chased whatever rays I could find by taping and retaping the ‘photo’ to just about every window all around the house. My husband cracked up when he pulled up after work to find this fellow taped on the picture window facing our front lawn, for the entire world to see! What will the neighbors think, right? We decided that they’d better get used to it. Download the guide here and see what I mean. I hope you have as much fun with the projects as I did making them. If I can’t go back to Texas, I’ll just have me some fun creating an Educator’s Guide about my beloved Lone Star State. Thanks to my good friend author Anne Bustard, that’s exactly what I got to do! Just take a quick moment and check out the fun projects this guide is filled with, projects that tickle the creative side of the brain as well as the academic. 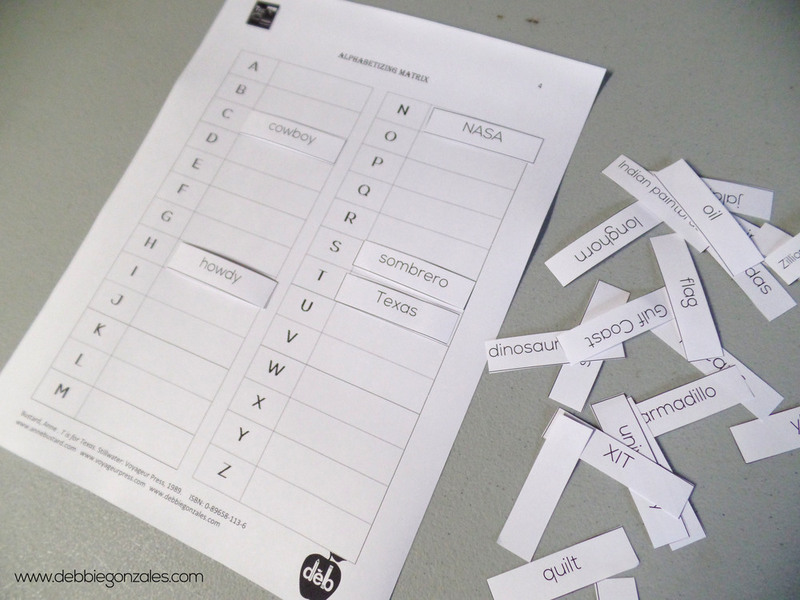 Why, we’ve got an awesome alphabet matching game and crossword puzzle, each with their very own answer sheets. What’s not to love about this macaroni-backed armadillo? Isn’t he darling? And, those fingertip bluebonnets are just about as a cute as a pig’s ear, don’t you think? 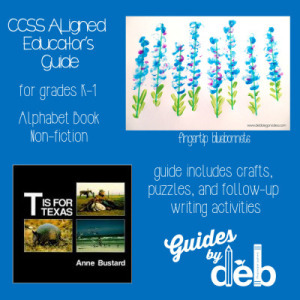 Y’all, instead of hopping a flight to the heart of Texas, why don’t you simply download the Educator’s Guide right here and have some southern-fried fun. It helped to take care of my homesick, bluebonnet blues for a little while. For that, amigo, I am mighty grateful! 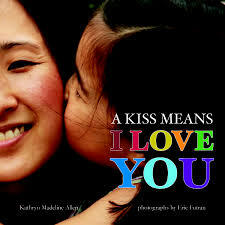 Overview: A Kiss Means I Love You is charming a book that helps you teach children the meanings of facial expressions and gestures. Children will wave, clap, and cheer along with you as you read the light, rhyming verse paired with delightful photos of young children.